Mpingwe Sports Club (MSC) Grey Royal Motors on Sunday made history when they triumphed by 59 runs over MSC Silver in the finals of Inter-Club T-20 Cricket League at Oriental Cricket Club (OCC) in Blantyre to secure their first title. Batsman Anas Gohdi, who was named man-of-the-match, proved to be the key in scripting Grey’s success as he individually made 92 of his team’s 195 runs as his team-mates Soyab Pathan and Sohel Malik contributed 39 and 35 runs, respectively. Omar Haslord, Harun Patel and Ibrahim Sirgat sweetened the victory by claiming two wickets each. Silver were elected to bat first and they made a total of 136 runs with the tournament’s best batsman Asif Rustam scoring 43 of the total runs and bowler Sajid Kaka taking three wickets. “This is our time to shine. We have been underdogs for too long and we had to do anything possible to make history,” said Grey’s captain Ilyas Bhiku after receiving a trophy from the competition’s organising committee chairperson Shiraz Zaveri. Signs of Grey’s determination to end their title drought started to show in the semi-finals, where they booted out last year’s champions MSC orange by a wicket after scoring 99 runs apiece. In the other semi-final, Silver saw off MSC White by 41 runs following a total score of 175 runs. 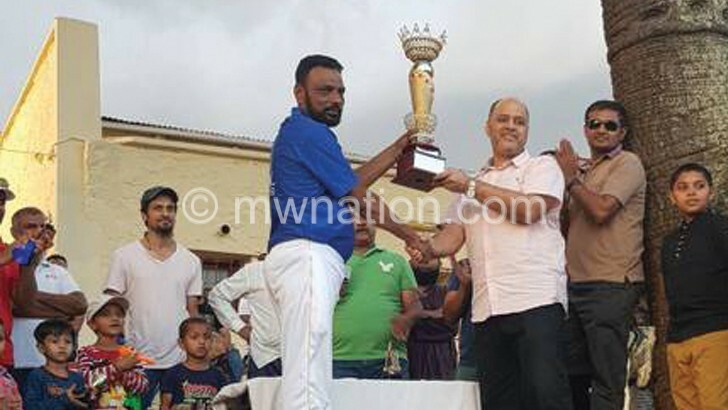 Rizwan Limbada of MSC Orange emerged the tournament’s best bowler.